Analysis of uronephrological incidence in children in the Russian Federation according to official statistics Apolihin O.I., Sivkov A.V., Moskaleva N.G., Solnceva T.V., Komarova V.A. Initial results of the target program for the prostate cancer diagnostics in Kaluzhsky region Efremov E.A., Gusakova D.A., Mel'nik Ya.I. Evaluation of men’s reproductive health among youth in Kuzbass region Titarenko I.N., Osadchuk L.V., Kleschev M.N., Gutorova N.V., Farbirovich V.Ya. Sodium hypochlorite in regulation of renal tubular concentration function Ivaschenko V.V., Danilkov A.P., Golovanov S.A., Kirpatovskiy V.I., Kudryavcev Yu.V., Drozhzheva V.V. Crystal formation activity of urine in oxalate urolithiasis Golovanov S.A., Drozhzheva V.V. Clinical efficacy and safety of Tulosin (tamsulosin) in patients with benign prostatic hyperplasia Sitdykova M.E. Microcirculation in urinary bladder wall and clinical symptoms of overactive bladder in women Al'-Shukri S.H., Kuz'min I.V., Amdiy R.E., Boriskin A.G., Slesarevskaya M.N., Lukina E.E. Bladder cancer genetic risk factors Pavlov V.N., Izmaylov A.A., Viktorova T.V., Izmaylova S.M., Galimzyanov V.Z., Ahmadishina L.Z. Rezorba in treatment of metastatic prostate cancer bone lesions Kaprin A.D., Sivkov A.V., Oschepkov V.N., Gafanov R.A., Keshishev N.G. Effectiveness of Cernilton® in patients with chronic аbacterial prostatitis Apolihin O.I., Sivkov A.V., Oschepkov V.N., Keshishev N.G., Bedretdinova D.A. 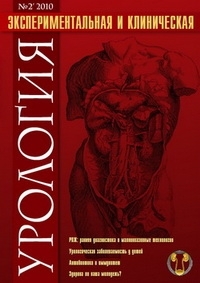 Prostate cancer cryotherapy Zhernov A.A., Keshishev N.G., Shaderkin I.A., Koryakin A.V. An experience of TVT-secur* application for urinary incontinence in women Kachmazov A.A., Zhuravlev V.N., Romih V.V., Zhuravlev O.V., Bazhenov A.A. Features of apoptosis induction in peripheral blood lymphocytes culture in patients with various forms of acute pyelonephritis Hodyreva L.A., Sinyuhin V.N., Harlamova L.A. The effect of antibacterial agents on cytokine production by mononuclear cell fraction of peripheral blood in patients with chronic renal failure Kareva E.N., Yarovoy S.K., Bolotova E.N., Shimanovskiy N.L.